It's official! The rumored September 12th event was officially announced on the 4th! It is assumed by the invitation that this is the long awaited, long rumored iPhone 5 release. I've seen many, many crazy rumors about what the new iPhone might have/look like. However, some of the rumors I think are very likely. I'll cover a few of the most interesting rumors here. LTE. 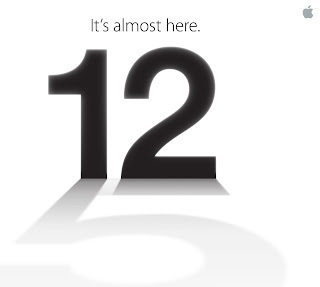 The iPad 3 already has LTE, and it would only make sense for the new iPhone to have the same technology. Of the many rumors floating around, I think this is the most likely one by far. A 4-inch screen. Many sites have already reported that the new iPhone will sport a new 4-inch display. It makes sense, considering that the 3.5 inch display is a bit small and cramped, especially next to other hot smartphones such as the 4.8-inch Galaxy S III, the 4.3-inch Nokia Lumia 900 and especially the gigantic 5.3-inch Galaxy Note. The original iPhone had a 3.5-inch display back when it was released in 2007, over 5 years ago. The industry has changed dramatically since the original release and I think it's time for change. Also, rumors are saying that the new iPhone won't be wider, just taller. This makes total sense, considering that scaling up the display will drop the DPI to a lower than retina resolution. If the iPhone 5 has the rumored screen it will also be 16:9, a nice change from the 4:3 of the iPad and the 3:2 of all the other iPhones. Rene Ritchie has a good post over on iMore that explains this in much more detail. I think this would be a welcome and very likely change to the next generation iPhone. A new dock connector. Cnet and several other sites have circulated a rumor that Apple is changing the 30-pin dock connector. However, they can't all agree on what the new dock connector will be. Some say a 19-pin connector, some say 9-pin, others say 8-pin...it's all a crazy mess. One thing they do all agree on is that the 30-pin is out and a new connector is coming to take its place. I don't really have a strong opinion on this one. The 30-pin connector is over a decade old, since it shipped with the very first iPod, released on 2001. Technology has come a long way since 2001, and what was once accomplished by a large 30-pin connector can now be replaced by a tiny connector that could be even smaller than USB. I don't really know if this is a good thing or a bad thing. On the one hand, a smaller and potentially thinner data port will allow for a thinner and lighter iPhone. One the other hand, many people have a vested interest in the 30-pin connector. They've bought charging cables, docks, speakers, alarm clocks, and even cars that all have the same 30-pin connector. But, iLounge announced that Apple is rumored to sell an adapter. That brings along a whole set of other problems. The adapter is rumored to cost about $10, which is far from expensive, but a little adapter can easily get lost or misplaced. And what happens when you forget the adapter? More than likely you'll end up with a couple in each room, one in your bag, pocket, purse, etc. That $10 when multiplied out can get pricey. All that being said, I still don't have a strong opinion on the subject. I think Apple, whether or not it decides to change the dock connector, will have a good reason to change the connector.